By Lynda Cheldelin Fell, Stephen Hochhaus, David Allan Jones In Books Tagged In David Allan Jones, Lynda Cheldelin Fell, men, Stephen Hochhaus, and widow. 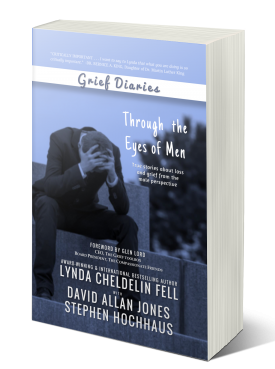 Through the Eyes of Men offers a unique glimpse into the different styles of grieving as seen through the eyes of 14 men. From the very moment their lives were changed, real men share their hearts, their intimacy, and their families. The grief journey is followed all the way to where they have figured out what it means to them, and their lives, for their love to live on in and through them.